Deutsch Nepal and Lina Baby Doll is back after 5 years in the retreat of the Swedish woods with a new album - “Alcohology“. Obviously in between (or even during) the recordings there was some examination of bottles and the liquor they contained going on, the object for the album is the impact alcohol might have on people when consumed. 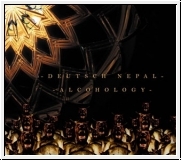 Alcohology mainly contain slow pounding industrial music in the vein that are familiar to all Deutsch Nepal fanatics in the same way as the previous album Amygdala. Swirling mirrors of looped sounds loosely glued together with pounding or haunting beats followed with simple melodic input. The dystopian vocals present a surrealistic scenario built up inside your head while listening. The album take off in the track Alcohology Superior which might be a praise to the misery of a meaningless life only decorated with boredom, violence and a lot of alco… and then the study of the fact of this situation - Alcohology … followed by To the Earth’s bombastic description of celestial visions that might strike one under intoxication … “and falling asleep outside the liquor store one day“ together with a hungry Python. The thoughtful statements of the gain and dangers of the consumption of alcohol continues as a theme all through the album and end with a re-recording of Erosion from the album with the same name from 1999 where the impact fluids have, not only on the human body but also on Mother Earth itself. Though a frequent appearance on stage alone or together with others in different constellations releases from Deutsch Nepal are comparably rare. So don’t miss this chance for some fresh Deutsch Nepal released on Entartete Musikk.